Image description: All vehicle will experience various paint damages such as fine scratch, paint blemish, deep scratch, acid contamination, water mark and lastly the gravel chip which could easily penetrate into the base coat and high chances of destructing the primer/main coat. With Magnus Pro PPF install on top of the paintwork, it can prevent from those damages yet preserve the original aesthetic appearance with superior clarity and gloss. 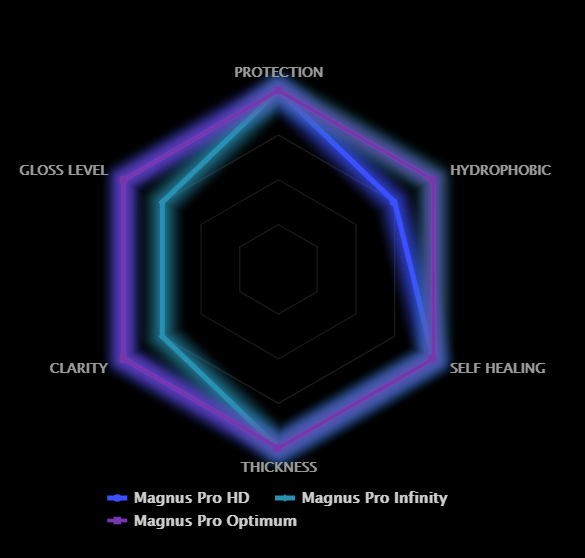 Magnus Pro offers few product lines to fulfil the ever-changing market demand. Each of our film excel in one of the key features such as insane clarity, superb hydrophobic and miraculous instant self healing. You name it, we have it all here under one roof – HD, Infinity, Optimum. Unique SiO2 coating embedded on the top layer of the Magnus Pro film which enable Proprietary of Self Cleaning feature & anti stain for maximum dirt and stain resistance against environmental contaminants and graffiti. Ultra thick polyurethane is measured in multiply of hundreds of microns thicker than original clear coat. 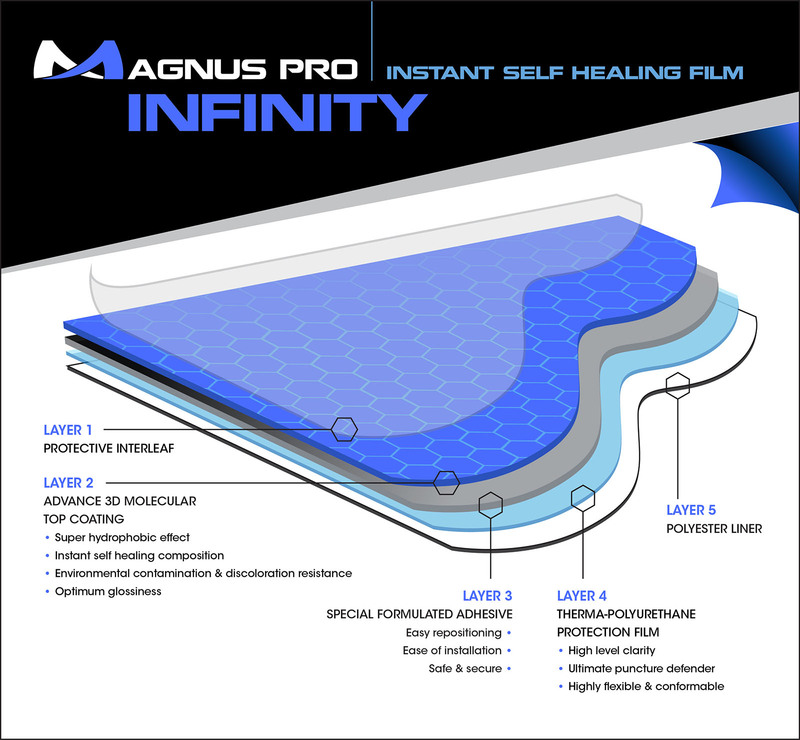 Through revolutionary technology, Magnus Pro Infinity offers a key feature of instant self healing. The film can self recover itself from swirl mark, light scratches caused by improper wash techniques and normal daily driving without any external heat element. Boasting with 215 micron thickness, yet promising unrivalled glossiness and extremely high level of clarity. The film is remarkably clear and glossy that it seems bare-naked with original paint. With the ultra thickness, it assures the paint is well protected at all times. Proprietary of Self Cleaning feature & anti stain for maximum dirt and stain resistance against environmental contaminants and graffiti. Optically clear clarity & exceptional high gloss added to paintwork. Self healing capability against minor scratches and abrasions. 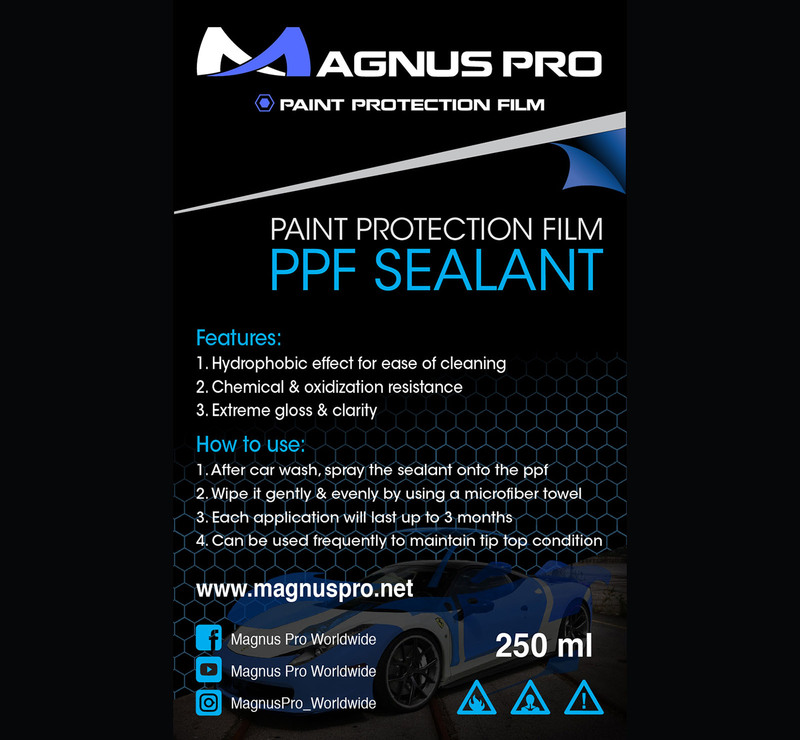 Magnus Pro Sealant is formulated as a acrylic polymer mean to protect the aliphatic urethan paint protection film. The sealant will form a strong bonding with the film’s molecule structure and create a sacrificial barrier from environmental defect, bugs and UV exposure due to the special formulation with the Magnus Pro film, the sealent is much more effective as compare to the regular waxes. What is the durability of Paint Protection Film (PPF)? A professional installed and proper maintenance of Magnus Pro PPF is warrantied for 6 years (terms and conditions apply). How should I maintain my car after installing PPF? We highly recommend car wash minimum once a week and a finishing step with a simple spray on sealant application if preferred. 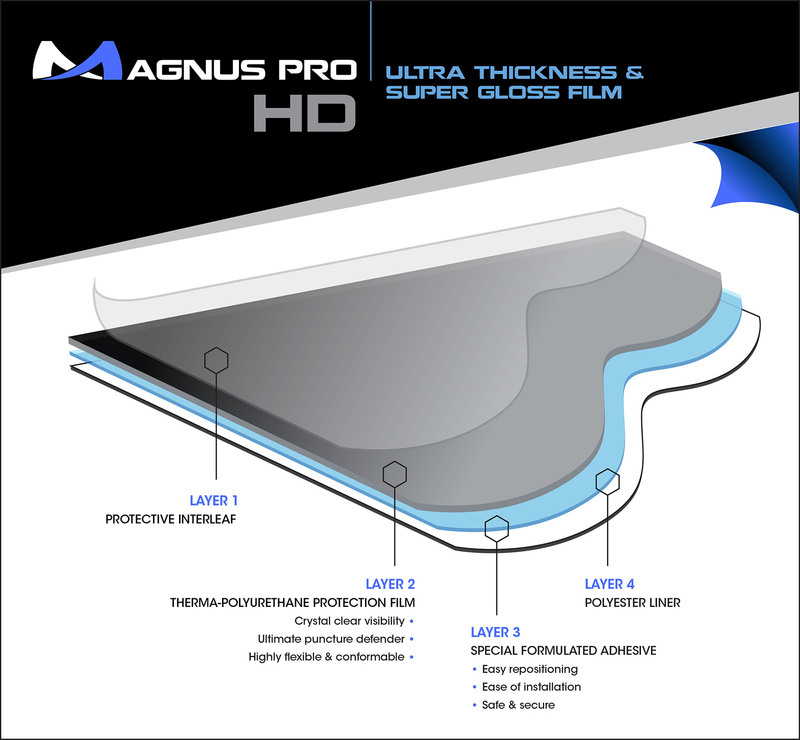 Magnus Pro PPF is embedded with a layer of glass coating for additional protection. Should I wax or polish my car after installing PPF? Good news is that no polishing or waxing is required after PPF installation. It will retain its condition & features with just simple car wash and spray on sealant finishing. Will I notice any seam after the film is applied? We fully custom cut all PPF according to each part of the car using state-of-the-art plotter machine and fully wrap the part wherever its possible. How to choose between PPF and coating? Glass coating is few micron ultra thin layer of protection, an affordable protection option against mild environmental fallout, dust/debris and oxidization. PPF is a tangible and solid form of protection against scratches, stone chip, environmental fallout and oxidization. PPF is so robust as its thickness is considerably 200% to 400% thicker than the original clear coat. These two options only require a weekly car wash and spray on sealant minus out the polishing and waxing to stay vibrant. Can I install PPF and get it coated as well? Definitely! Magnus Pro PPF can be coated with our ceramic based coating for ultimate layer of protection yet remains glossy and vibrant.